Bryan Berg has been practicing his craft, building houses of cards, since he was a kid. When he was 17, he broke the record for the world’s largest tower of cards, then later broke that same record again in 2007 with a 25-foot tower. Given his love of stacking cards and his background as an architect, it’s only a natural that Berg would turn his unique talents and background towards another world record: the largest house of cards ever built. 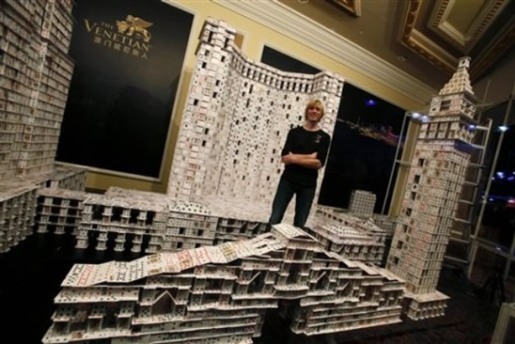 Using some 4,051 decks of cards, he built a 218,792-card replica of the Las Vegas strip at The Venetian Hotel in Macau’s Cotai Strip. The structure is 35 feet long and weighs some 550 pounds. If you placed the cards end to end, you’d have a line of cards 10 miles long! Enjoy it while it lasts; to prove he built his model fairly and without using glue or tape, Berg is knocking down the whole thing in 10 days.